Angus and I started chatting on Christian Connection in early January 2014 (I had been a single mum of two beautiful boys for 8 years and had really given up hope that I would ever meet someone). We were getting on really well and had a lot in common so eventually Angus asked if I'd like to meet him and I said that I'd love to! So, on the 9th of February 2014 we had our first date which went brilliantly. There was a certain little date approaching (Valentine's Day) and Angus sent me a single red rose to work which was lovely! We chatted online every day and met up as often as we could. This was difficult as we lived 2 hours apart, both work full time and have commitments to our children - Angus has two children who he sees regularly. 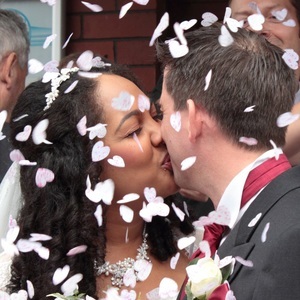 We fell in love very quickly - I guess you could call it a whirlwind romance - and within a couple of months of meeting we knew we wanted to get married! Angus asked my dad's permission and on April 25th he proposed to me! I said yes straight away and we bought my engagement ring together. The children all got along well together. Ninety-nine days after getting engaged we got married - on August 2nd 2014. It was the most amazing day ever! We went on 'honeymoon' with our four children to Disneyland Paris and we all had lots of fun. We know that God was instrumental in bringing us together and our marriage is an answer to both of our (and our families' and friends') prayers. We are both very grateful to Christian Connection for helping us meet. We never would have met without the site. My advice for anyone trying online dating: be open minded about who you chat to and meet up with as you can be surprised about who turns out to be perfect for you and don't give up as you really never know when you'll meet that special someone - lots of people said this to me and I found it very hard to hear but it has turned out to be true!